Recently, I’ve taken on a personal project to apply the Python and machine learning I’ve been studying. Since I’ve an interest in population health, I decided to start by focusing on understanding a 15 year population health specific dataset I found on Kaggle. This dataset was from the US Center for Disease Control and Prevention on chronic disease indicators. In this blog series, I want to demonstrate what is in the dataset with exploration. Later on, I’ll go into more of the data visualization. At this time, I’m not sure I see the opportunity for actual machine learning with only this dataset. According the the overview on Kaggle, the limited contextual information provided in this dataset notes that the indicators are collected on the state level from 2001 to 2016, and there are 202 indicators. Using jupyter notebook and pd.read_csv() on the file, there are 403,984 rows with 34 columns, or attributes. By running .info() method, the second column in the output below shows that we’ve some missing data. In the last column below, there are different types of data where some are numerical such as integers and floating values and others are objects containing strings of characters. Topic: 400k+ rows of data are grouped into the following 17 categories. There is a corresponding column called TopicID that simply gives an abbreviated label. Question: Within each topic, there are a number of questions. There is a corresponding column QuestionID that we’ll use. These are the 202 unique indicators that the dataset has values, and we’ll analyze this further. DataSource: Given that we’ve so many indicators, I’m not surprised that there are 33 data sources. However, the following histogram shows that the majority of the data comes from two sources, BRFSS, which is CDC’s Behavioral Risk Factor Surveillance System, and NVSS, which is the National Vital Statistics System. DataValueUnit: Values in DataValue consist of the following units, including percentages, dollar-amounts, years, and cases per thousands. DataValueType: The following categories are insightful showing that there are age-adjusted numbers vs the raw numbers which help us with comparison when we want to look at data comparing across states. DataValue vs DataValueAlt: DataValue appears to be the column of data that will be the target in our future analysis. Using .head() method, this column consists of numerical values as string objects while DataValueAlt is numerical float64. Later on, I want to use pandas pivot_table method which requires only numerical data. As result, I will be using DataValueAlt to produce on the analysis down the line. Stratification and Stratification Category related columns: There are 12 columns related to stratifications, which are subgroups within each indicator such as gender, race, age, and etc. In StratificationCategory1, there is gender, overall, and race. In Stratification1, the values consist of the types of race as an example. In the ID columns such as StratificationID1, we have corresponding labels for race. Using a matplotlib below and a seaborn to produce a heatmap, it’s easy to see where there is data and where is it missing and how much is missing. Yellow represents the missing data. The columns are each of the indicators, and the vertical axis is just the 400k rows of data. Large portions of missing data is related to Stratification Categories 2 and 3 and the related Stratification 2 and 3. 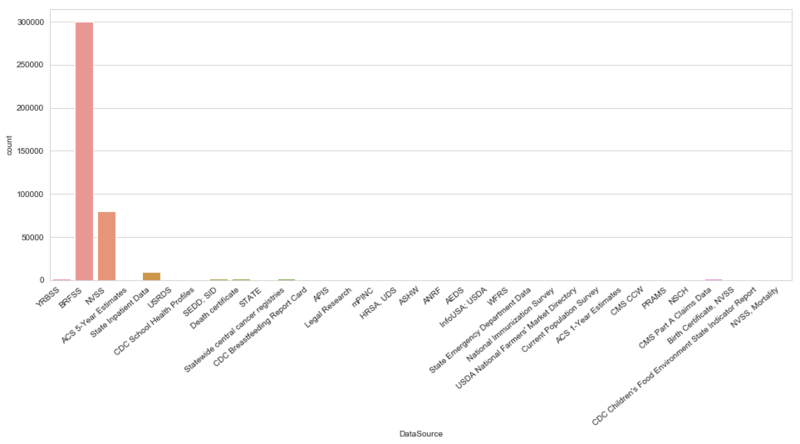 The horizontal axis consists of the column names. As an example, the count of the column returned 79k that had data. I wanted to see what’s in there so I set up for loop to go through each element in the specific stratification 2 or 3 column and append values that are not null or with blank spaces to a new array called df_strat2cat. This resulted in an array with no values surprisingly. After repeating this with the other stratification columns, I dropped this set of columns. 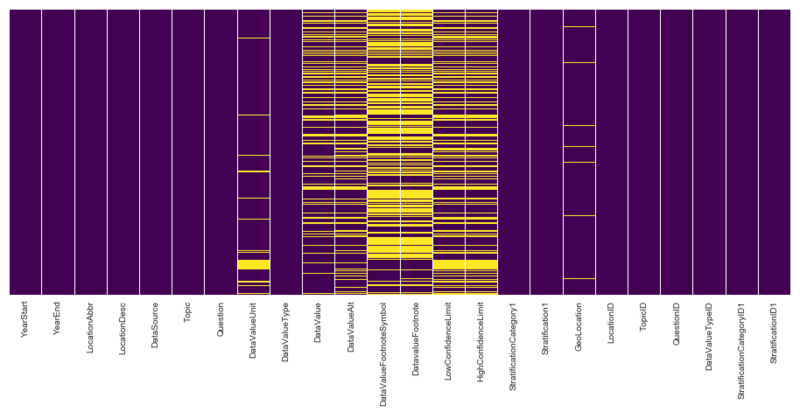 With df_new, the seaborn heatmap shows minimal yellow and mostly purple. If we wanted to go further, we could fill in the missing data, but at this time, I’ll leave additional work for a later stage. To recap, I imported the CSV data file into a dataframe using pandas. 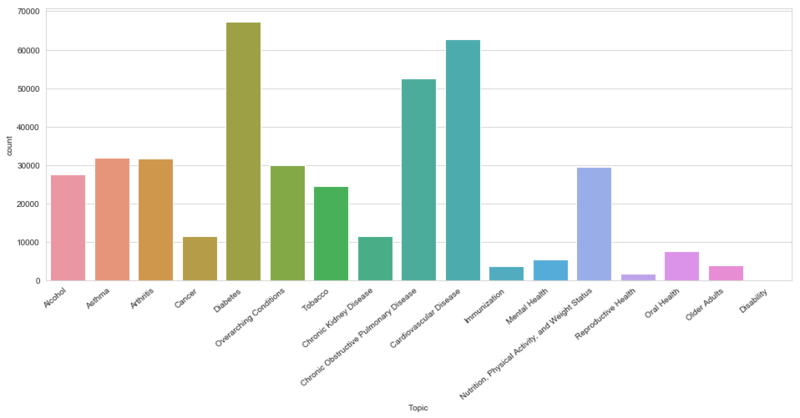 Then I used various approaches to better understand the data within each column since there was very limited contextual information. The group of stratification 2 and 3 columns were not useful and these were removed. In the next post, we’ll take the resulting dataframe to understand the data even further to understand the relationships of specific indicators.